Relative strength investing has a proven track record of success. Most traders have heard the term, but know very little about developing or trading strategies based on relative strength. The concept is simple: buy the strongest securities and sell the weakest securities. This brings up the obvious question: how do we define the strongest and weakest securities? I recently read about an interesting new relative strength indicator in a May 2012 Active Trader article titled "The Efficient Rotation Strategy," written by Volker Knapp. 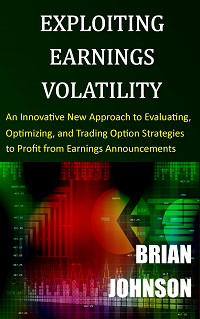 Knapp used the Efficiency Ratio (ER), which was developed by Perry J. Kaufman and explained in his 2005 book New Trading Systems and Methods, to implement a rotational strategy that earned a 430% return from February 2002 to February 2012. Those results may seem incredible, but are not uncommon for relative strength rotational strategies. This article will examine Kaufman's indicator in more detail and suggest some improvements. Various applications of this indicator will also be discussed, including Knapp's rotational strategy. I trade a number of different rotational strategies, each based on a unique security list. 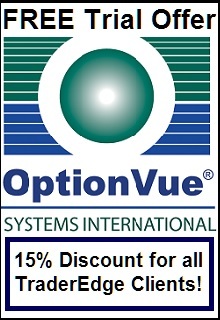 I have separate rotational strategies for ETFs, commodity futures, currency futures, and a model that I use for asset allocation purposes. There is no limit to your choice of securities, but all other strategy elements (ranking formula, stop rules, profit targets, etc.) must be applicable to every security on your list. As I mentioned before, most rotational strategies are based on a measure of relative strength. It would seem logical to rank the securities based on the rate of return over a recent time period. In my experience, this type of ranking methodology results in strategies that take far too much risk and suffer undesirable draw-downs. Instead, if you use a return based formula, be sure to also adjust for risk. 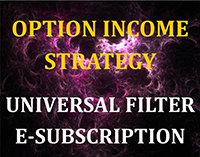 That will help your strategy shift toward more conservative investments in difficult markets. In addition to a ranking formula, I also recommend adding filters to prevent contra-trend trades and to avoid purchasing in overbought or selling in oversold environments. I will discuss Kaufman's Efficiency Ratio formula later in the article. The frequency should be a function of your investment horizon. If you are a short-term trader, you could calculate a new ranking every day, which would result in a large number of daily transactions and significant transaction costs. If you have a longer investment horizon, you could calculate a new ranking weekly and rebalance your portfolio at the end of each week. If you would like to lower your transaction costs further, consider monthly or even quarterly periods. I prefer to use stop loss levels in my rotational strategies to avoid excessive losses on individual positions. This is especially important when trading individual stocks. Keep in mind that longer rebalancing intervals will require wider stops - to allow your securities sufficient room for normal price fluctuations. However, shorter intervals will obviously increase your workload and your transaction costs. 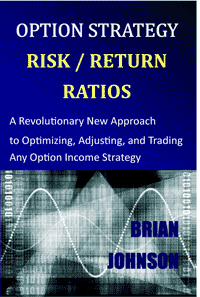 To keep it simple, most rotational strategies allocate the same percentage of capital to each new position. If you invest in the top five securities in your list, each would represent 20% of your capital allocated to the strategy. If you only purchase the top two securities in your list, then each would represent 50% of your capital. As you reduce the number of securities, you dramatically diminish your level of diversification. However, by definition, each additional security that you add to your portfolio would have a lower ranking than your existing positions and would therefore have a lower expected return. This is a classic risk/return trade-off. It is not uncommon for relative strength rotational strategies to hold very few positions. This is definitely true of my strategies. If this is the case, then you must limit the amount of capital you commit to each rotational strategy. This will allow you to integrate rotational strategies into your investment process without taking an excessive amount of risk. As you can see, you have a lot of choices to make when developing rotational strategies. For that reason, I would strongly encourage you to back-test your rotational strategies. With all of the typical caveats, you could even optimize your strategy using the above parameters. Experiment with different ranking systems, change the number of positions, modify the rebalancing frequency, and examine the results. This will give you additional insight into each of the steps above. AMIBroker has a strategy module with a built-in rotational engine. This makes it very easy to analyze a wide range of different parameters. Kaufman's Efficiency Ratio (ER) is a measure of trend strength, adjusted for volatility. The resulting measure is a proxy for relative strength. ER is calculated by dividing the absolute value of the change in price over N periods by the sum of the absolute value of the N-individual price changes. If all of the individual price changes were positive (or negative), then ER would equal 1.0. However, if there were offsetting positive and negative price changes, then the numerator would shrink and ER would decrease. The ER reflects the consistency of the price trend. All ER values will fall between 0.0 and 1.0. The ER is an excellent tool for quantifying the consistency of the price trend, but I prefer a slightly different formula that captures both the consistency and direction of the price trend. I use a Modified Efficiency Ratio (MER), which is the same as the ER formula, except it eliminates the absolute value in the numerator. The resulting indicator values fall between -1.0 and +1.0. Positive MER values reflect a bullish price trend, while negative MER values indicate a bearish price trend. 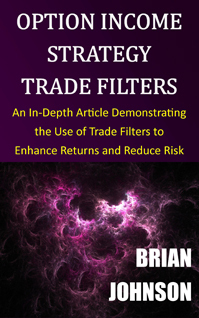 In the Active Trader article mentioned above, Knapp used Kaufman's efficiency ratio to implement a rotational strategy that earned a total return of 430% (after simulated transaction costs) over the last ten years. He tested his system on the Active Trader Standard Stock Portfolio, which is a list of 17 large, liquid individual stocks. However, instead of using the ER for a single period, he calculated an Efficiency Ratio Oscillator (ERO), which was the average ER over 10, 55, and 120 day periods. He used the ERO to calculate a new ranking every day, but he required that each new position be held for at least five days - presumably to reduce turnover and transaction costs. Finally, he selected the three stocks with the highest ERO and allocated 30% of the portfolio to each stock. Purchases and sales were made at the next day's opening price. As I explained earlier, Knapp's strategy earned a total return of 430% from February 2002 to February 2012, which equated to an annualized return of 18.14% over the ten year period. However, Knapp's strategy did experience a 49.8% peak to trough draw-down. Knapp's 18%+ annualized return is not unusual for rotational strategies and is generally consistent with the historical returns of my own rotational strategies. Unfortunately, Knapp's 50% draw-down is unacceptably high. If Knapp had used the MER instead of the ERO and added a simple trend filter, he probably could have reduced the draw-down significantly without compromising the total return earned by his strategy. Nevertheless, earning 18%+ compound annual returns with a very simple relative strength rotational strategy illustrates the potential of this approach. I use a different ranking system in my rotational strategies. However, after learning about the efficiency ratio, I plan to test my current strategies with the MER ranking system and see if my results can be enhanced. Applications of the MER are not limited to rotational ranking systems. The MER can also be used to help identify extreme overbought and oversold market conditions. I will use enhanced SWAMI charts below to demonstrate these conditions. I first learned about SWAMI charts in a March 2012 Technical Analysis of Stocks & Commodities article titled "Introducing SwamiCharts," written by John Ehlers and Ric Way. I was intrigued by this new tool and wrote an article about SWAMI charts on this blog a few weeks ago titled "Look at the Big Picture." If you are unfamiliar with SWAMI charts, please review this article. In brief, SWAMI charts use a color heat-map to depict all indicator values over a range of look-back periods on a single chart. SWAMI charts allow us to see indicator values for the entire range of look-back periods; unfortunately, some of the detail for a single look-back period is lost. To address this deficiency, I created an enhanced version of the SWAMI chart. The enhanced version of the SWAMI chart includes the standard SWAMI heat-map, but also overlays the average indicator values (calculated over all look-back periods) directly on the heat-map chart. This allows the user to visualize the full range of indicator values in the heat-map without losing the detail of actual indicator values. The resulting average indicator values can be used in mechanical strategy signal and filter rules, while the SWAMI heat-map cannot. To add a frame of reference for the enhanced SWAMI chart, I also included three horizontal lines on the chart. The black horizontal line in the center of the graph depicts the neutral value for the indicator, which is zero for the MER. The top horizontal line indicates extreme overbought conditions, while the bottom horizontal line identifies extreme oversold conditions. Figure 1 below is a daily chart of the Russell 2000 Index (RUT) from July 2011 to late April 2012. The top panel is a candlestick chart for the RUT with a simple moving average in purple. The second panel is an enhanced SWAMI chart for the MER indicator. Positive MER values are depicted in green and negative values are depicted in red. Neutral values are yellow. In the heat-map, short look-back periods are at the bottom of the chart and the long look-back periods are at the top of the chart. Finally, the blue line represents the average MER for all look-back periods. The purple line is a simple moving average of the average MER line. It is never advisable to base investment decisions on only one indicator, so I also included an enhanced SWAMI chart for my custom market breadth oscillator in the bottom panel. I discussed market breadth in detail in my earlier post titled "The Secret Weapon of Technical Analysis." Please reread this article if you would like a refresher on market breadth. In early August 2011 (green box above), the average MER and market breadth oscillator had both reached bearish extremes. The extreme bearish environment is evident by the depth of the red shading in the heat-maps. More specifically, the blue average indicator lines had dropped below the lower horizontal lines and had both risen above their respective moving averages. This suggested a potential market reversal or at least a pause in the downtrend. As you can see in the price chart above, this signal established a price floor that held for almost two months. This would have been an excellent opportunity to execute an out-of-the-money bull put-spread, betting that the bearish trend would not continue much further over the next month (more on option spreads in future posts). In early February 2011 (red box above), the average MER and market breadth oscillator had both reached bullish extremes (above the upper horizontal lines) and had both fallen below their respective moving averages. This suggested a pause in the uptrend or a potential market reversal. Similar to the previous example, this signal established a price ceiling that held for almost two months. This would have been an opportune time to execute an out-of-the-money bear call-spread. This time you would have been betting that prices would not continue to rise significantly over the next month. The two enhanced SWAMI charts appear similar, but are based on very different information. The MER is based on RUT prices alone, while the market breadth oscillator is based on the cumulative number of advancing and declining issues in the AMEX, NASDAQ, and NYSE exchanges. Both indicators are correlated with the market, but use very different data. Using multiple indicators with different data sources to confirm trading signals can significantly improve your percentage of profitable trades. The modified efficiency ratio shows promise as a relative strength ranking tool and as a means of identifying extreme overbought and oversold conditions. As illustrated above, relative strength is good, but you can have too much of a good thing. Buying securities with extremely high MER values or selling securities with extremely low MER values may not be prudent. Therefore, when using MER as a rotational ranking system, you may need to filter out these extreme values. However, when applied to market indices, extreme MER values can help identify market turning points or potential areas of price consolidation. While I do not suggest trading against the trend in stocks, futures, or ETFs, these reversal signals can be used with caution to implement out-of-the money credit spreads. They can also be used as a warning to take profits in your trend following strategies. As always, set stop levels to exit your trades and calculate your position sizes to limit the magnitude of your losses. 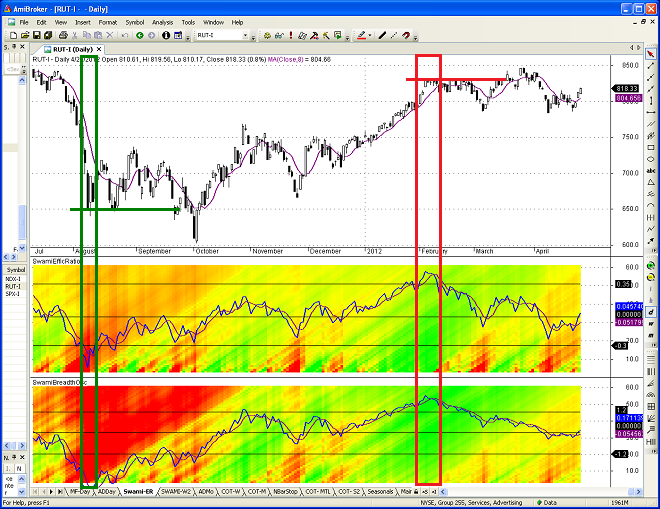 The enhanced SWAMI charts above provide a wealth of information about each indicator in a single chart. If you would like to experiment with enhanced SWAMI charts, the AMIBroker code for the MER is provided in Figure 2 below. The Trader Edge Asset Allocation Rotational (AAR) Strategy is a conservative, long-only, asset allocation strategy that rotates monthly among five large asset classes. The AAR strategy has generated 20%+ annual returns over the combined back and forward test period (1/1/1990 to 7/29/2013). Please use the above link to learn more about the AAR strategy. Do you have any questions about the material? What topics would you like to see in the future? 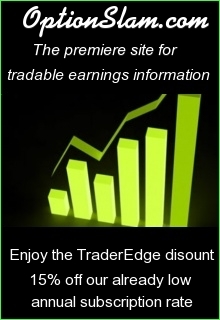 If you found the information on www.TraderEdge.Net helpful, please pass along the link to your friends and colleagues or share the link with your social network. The "Share / Save" button below contains links to all major social networks. If you do not see your social network listed, use the down-arrow to access the entire list of social networking sites. Copyright 2012 - Trading Insights, LLC - All Rights Reserved. This entry was posted in Economic Indicators, In-Depth Article, Market Breadth, Market Timing, Options, Relative Strength, Stocks & ETFs, SWAMI Charts, Technical Analysis and tagged AD, advance decline line, Economic Indicator, Enhanced SWAMI chart, ETFs, market breadth, market timing, oscillator, relative strength, Russell 2000, stocks, Swami, SWAMI Charts. Bookmark the permalink. Thanks for a very interesting post. Trying to apply your code in AB I get a syntax error at line 22 (unexpected Identifier). I would appreciate any help. Sorry for the delayed response; I did not receive a notification about your comment. 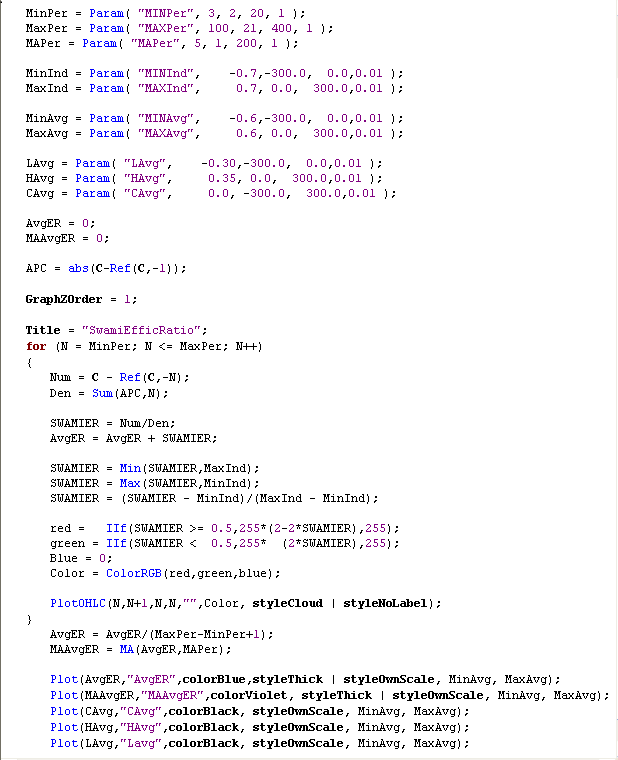 The post contains an image of my actual code for the SWAMI MER indicator and I am not getting an error message. I suspect that you have a typo in your code when you entered it from the image. If you would like to copy and paste your code into an email message (not an attachment), I will try it in AB and see if I can find the error. My email address is on the contact page. Sorry you were obviously right. I made two errors when copying the formula. It works great. Thanks. I am glad that you got it to work. You should now be able to use the SWAMI MER code as a template to create SWAMI charts for any of your technical indicators (RSI, MACD, etc). I hope that you find the enhanced SWAMI charts to be useful in your trading. Thanks for your interest in TraderEdge.Net.